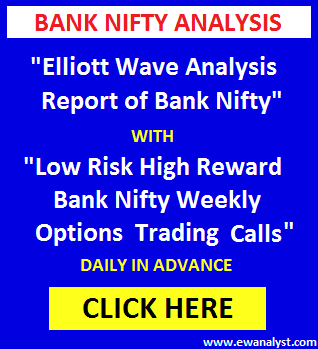 Bank Nifty opened lower at 26233, bounced to register day’s high 26323 but didn’t sustain at higher level and declined back again by more than 350 points to register low 25947 and finally closed 262 points down at 25999. Thursday, 26227 was the immediate breakeven point on downside with 26213 as pattern negation point. 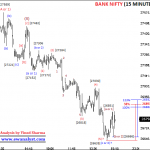 Bank Nifty was expected to fall further towards 25900-25605 if breaks below pattern negation point 26213. Trading strategy was to buy any suitable Put of 29th November expiry [which is trading around 60] if Bank Nifty even touches 26212 (break below 26213) using stoploss of 26345 expecting decline towards 25900-25605 in coming days. 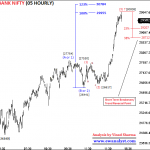 Bank Nifty opened at 26233, bounced till 26323 and then declined to register low 25947. Bank Nifty 25800 Put of 29 Nov expiry was available in 65-50 range, bounced till 132 and finally closed at 121. Now, we need to analyze fresh charts to calculate further move. The bounce from 24240-25915 looks like (abc) move and the decline from 25915-24353 is also looks like (abc) but next bounce from 24353-26379 seems impulsive. The overall pattern is bit confusing, so we will concentrate on last bounce started from 25353 for time being. So, let’s analyze last bounce started from low 24353 on separate lowest time frame chart to calculate further move. 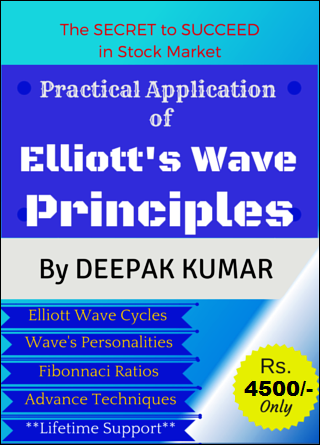 It seems wave (1) may be completed from 24353-25121, (2) may be completed from 25121-24528, wave (3) may be completed at 25907, wave (4) may be completed from 25907-25384 and wave (5) may be completed from 25384-26379. Overall, an impulse seems completed from 24353-26379. 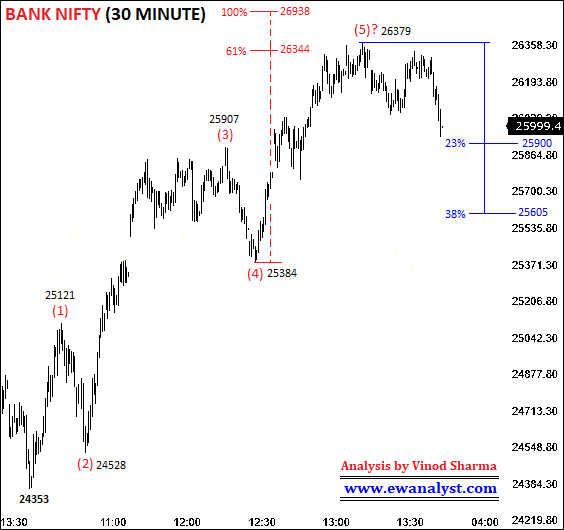 23%-38% retracement of progress of this impulse [24353-26379] is placed at 25900-25605. So, we can expect decline towards 25900-25605 in coming days. Now, we need to analyze the decline started from high 26379 on separate lowest time frame chart to calculate immediate levels. 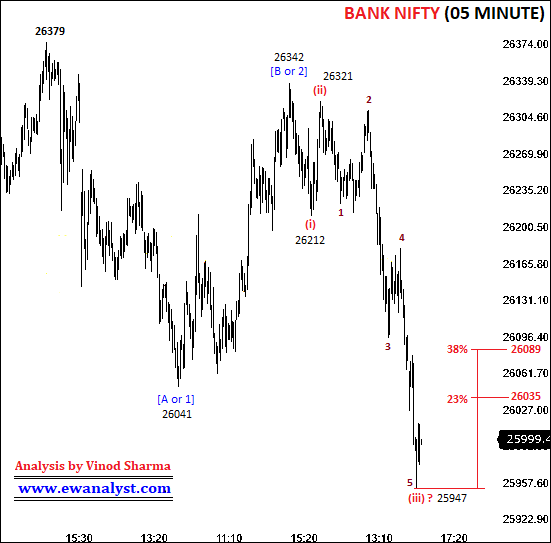 This is 05 Minute time bar chart of Bank Nifty covering decline after 26379 which I am analyzing independently. 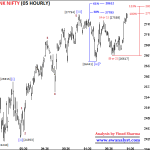 It seems wave completed from 26379-26041 may be wave [A or 1], wave completed from 26041-26342 may be wave [B or 2] or wave [C or 3] may be in progress from 26342. 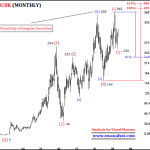 Within wave [C or 3], it seems wave (i),(ii) may be completed till 26231 and wave (iii) may be completed at 25947 or still in progress. 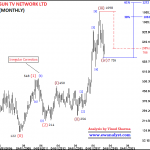 23%-38% retracement of progress of wave (iii) is placed at 26035-26089 which is the immediate resistance and 26089 is immediate breakeven point on upside. 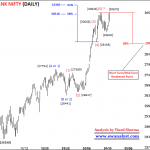 Bank Nifty charts are indicating that Bank Nifty can decline further below 25947, may be towards 25900-25605 in coming days. 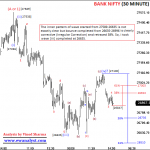 Now, 26035-26089 is the immediate resistance zone and 26089 is immediate breakeven point on upside. 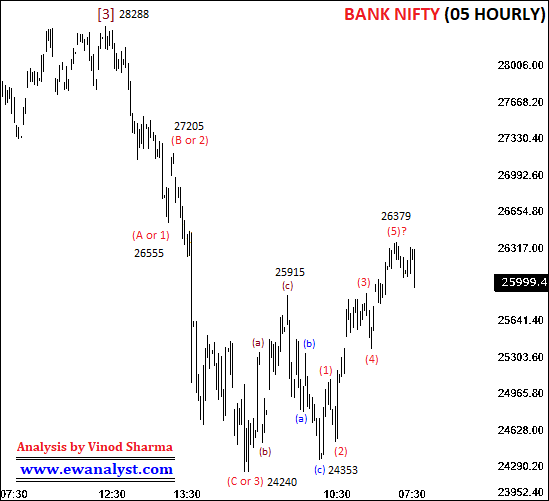 Bank Nifty if breaks and stay above 26089 by more than 15 minutes can result in further bounce towards 26342 and above. 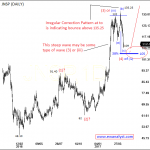 Otherwise, pattern is indicating further fall towards 25900-25605 in coming days/sessions. Those who bought Bank Nifty 25800 Put of 29th Nov expiry today in 26213-26300 range (Put was available in 65-50 range) and still holding can use 26111 (some point above 26089) as trailing stoploss. Otherwise this trade could have been closed because Bank Nifty declined near minimum target and 25800 Put bounced from 65 to 132 and was giving 60-65 points profit. Bank Nifty can give decline towards 25900-25600 from 26035-26089 range but minimum target will be only 135 points if we sell in 26035-26089 range. On upside, Bank Nifty if breaks and stay above 26089 continuously for 15 minutes can bounce further towards 26321 but minimum target is just 230 points if we buy near 26089. So, I am not suggesting any fresh trade because I am not comfortable in suggesting an option trade for just 130-230 points spot move. Risk reward for fresh trades is not reasonable. Trades who still want to trade can plan their own trade based on the conditions explained above.